Since their discovery in 1995, regulatory T cells (Treg) have been established as an anti-inflammatory T cell population which attenuates and modulates immune responses on multiple levels including initiation, progression, and termination. Over the past decades intensive research on this new T cell subtype led to deeper understanding of the intrinsic mechanisms of the immune system to contain and control inflammatory reactions. Graft-versus-host disease (GvHD) developing after allogeneic hematopoietic cell transplantation (allo-HCT) belongs to a variety of diseases, in which the immune system runs amok and attacks the own body in an autoreactive manner. 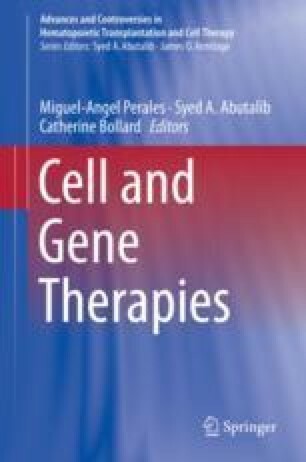 As soon as the immense potential of Treg to downregulate excessive autoimmune responses became evident, multiple translational approaches have been pursued in order to unravel the suppressive capability of Treg in GvHD and be able to control or even prevent this fatal complication in the clinical setting. Ultimately, researchers and clinicians want to find a way to establish long-lasting tolerance within the graft without diminishing the beneficial graft-versus-tumor/graft-versus-leukemia (GvT/GvL) effect. The chapter will give an overview of Treg characterization and functional abilities in order to explain thereafter their diverse influence in the pathogenesis of GvHD which is mainly studied in preclinical models and conclude with a review over completed and current clinical trials.